The theme of the entire fair is “Transaction,” and together we are invested in all notions encompassed by term: action and mission, enterprise and negotiation, activity and connection. Appraising and dealing are transactions inherent to an art fair, but far outside of the scope of what matters to us. Our primary interest and purpose lies in foregrounding the integrity and commitment of the artists involved. Each of their individual projects demonstrates a critical engagement with the city and/or community; each redefining, subverting, responding to or simply ignoring the economics of a traditional art practice. McKendree Key's ongoing project, The Den Transaction, is located in a small, hand-built cabin in the backyard of her Brooklyn apartment. Dubbed “an experiment in space as a commodity,” Key invites visitors to spend the night in The Den in exchange for goods or services. Gardening, cooking and construction are just a few of the services welcomed for trade. Katarina Jerinic volunteers to care for a plot of land, temporarily acquired from the city, just off the BQE in Brooklyn. It’s an overlooked triangle of landscape filling up continuously with debris and trash. Part public artwork, part self-assigned residency, Beautification This Site is Jerinic’s project of labor and dedication, as she takes on the sole responsibility of maintaining the city median. Jody Wood’s project, Beauty in Transition, positions aesthetics in the place where art and life meet. She organizes a mobile beauty salon that provides free haircuts to people living in homeless shelters in Manhattan and Brooklyn. Unlike food and housing, her service is deemed “non-essential,” yet it has the potential to elevate self-perception and transform individual lives. Amanda Browder coordinates community sewing days, inviting the public to participate in the construction of her site-specific, building-sized fabric installations. Men and women of all ages are invited to help construct her monumental, technicolor public sculptures that in their final form celebrate and embody neighborhood involvement, volunteerism and contemporary art in the everyday. 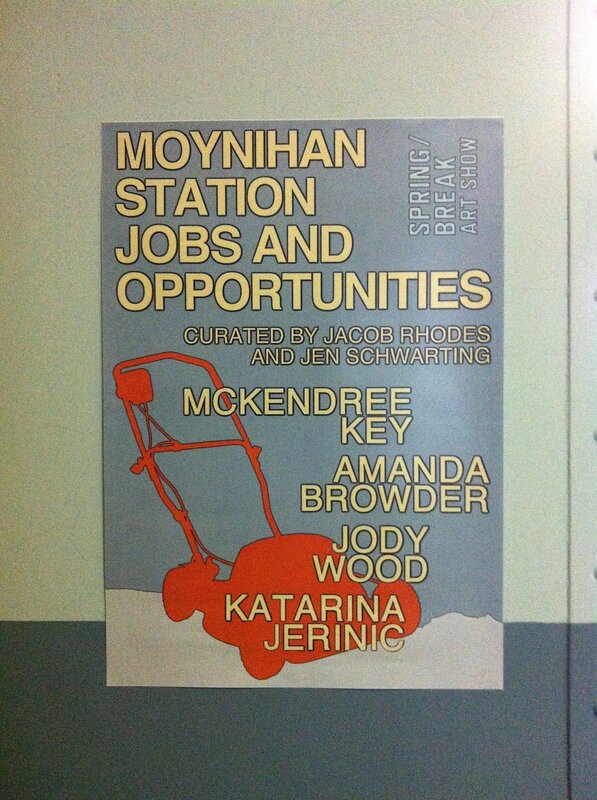 As an exhibition, Moynihan Station Jobs and Opportunities reflects the energy and ingenuity of the four artists’ experimental practices in the field. We have designed the exhibition to be an expansive platform for information, illustration, storytelling, documentary and photography. We are thrilled to be bringing these socially conscious projects into the social sphere of a contemporary art fair. In addition to the project documentations, artist talks and events will be held in the space throughout the week.